The family of a man found dead at a flat in York have paid tribute to him. 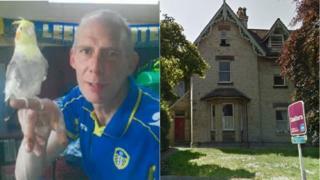 Shaun Skelton's body was found at a flat in Chancery House, in Holgate Road, on Sunday. In a statement, the 53-year-old's family said: "Shaun was a father, son, brother, uncle and granddad who has been taken from us too soon." Daniel Thomas Reed, 19, of no fixed address, has been charged with murdering Mr Skelton. He is due to appear at Leeds Crown Court on 7 April. Mr Skelton's family said he was "a quiet man who kept himself to himself with a love of pet birds and was an avid Leeds United supporter". They added: "He will be sadly missed by us all."